I wanted to share one of my favorite organizing tips I found years ago. I love Real Simple Magazine, as many of you who follow my blog know. I happened to see a great idea for storing all those odds and ends that would otherwise end up in a junk drawer and not being found when you need them – an over-the-door shoe organizer. I do use one of these on my closet door for shoes, but I have another in my hall/entry closet. It is so convenient to access and so easy to find what we need. My last one had clear pockets so we could see what was in each compartment. However, after that one started to rip (after several years of use), we bought a new one. The new one we got from Target has translucent pockets, though. Do you have a neat organizing trick you have found that works great? Please share in the comments section! 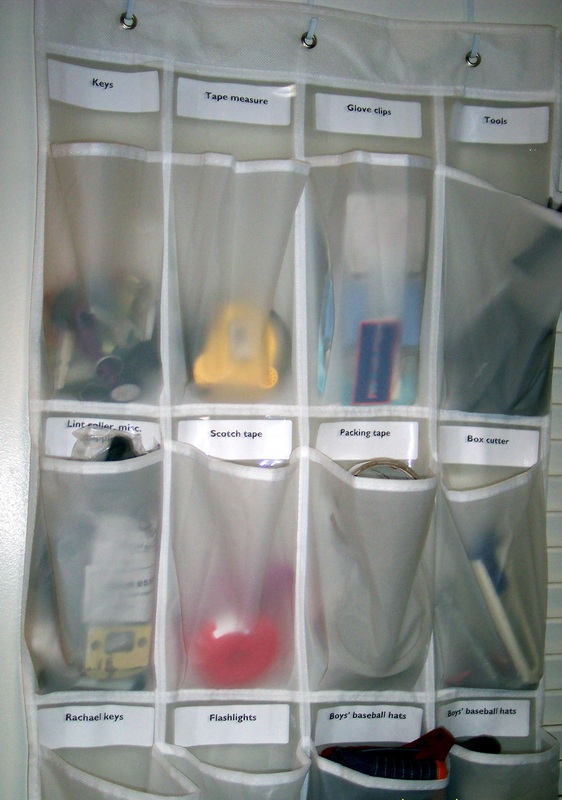 We have a bi-fold door on our front closet so this style organizer doesn’t work for us. We use a 10-pocket hanging shoe organizer that hangs on the rod of the closet but is only 6″ wide so it doesn’t take up too much space and that holds everyone’s hats, gloves, etc. Someone recently came into my house and commented on how great the set-up was for organizing all of our (2 adults and 4 kids) stuff. Thanks for all these great ideas. It is always good for people to see different options so they can pick what will work for them! Thanks for reading my blog. Please check out some of my other posts!